Why I no longer call myself a "professional organizer"
I am very proud of the work I do to help people eliminate clutter from their spaces and lives. With my guidance my clients are better equipped to let go of the things that don't serve them and to redirect precious resources (time, money and energy) into the things that are truly important to them. By investing in health and self-care, family and relationships, career and personal growth, we can all improve our quality of life. Far beyond delivering clients immaculate homes, this is my true purpose. Most professional organizers share these values and goals. Unfortunately, the organizing industry has been somewhat co-opted by profiteering companies looking to sell us more stuff. Rather than helping us to let go of the clutter, these forces encourage us to shuffle it around - or worse, spend time and money creating neat little storage solutions for it. In order to distinguish myself from this agenda, I am now referring to myself as a Personal Organizing Coach. 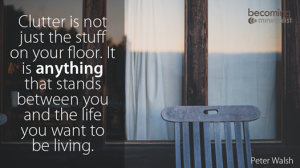 The purpose of organized living is to enjoy life to the fullest - by being good stewards of our resources and by valuing experiences over things. As an Organized Living Coach, I aim to help my clients achieve sustainable, long-term habits that result in a life lived in line with their individual priorities and value.